Need A Touchless Toilet? Want To Convert Your Urinal Into An Automatic Toilet? TouchFree Concepts Is Your Solution For Urinal Flush Valve And Automatic Toilet Flusher Parts And Kits. Make Your Toilet An Automatic Toilet And Save Even More With FREE SHIPPING On Orders Over $50. Businesses are often judged by the cleanliness of their bathrooms. Our automatic flushers will keep your restrooms clean and flushed at all times. These motion sensor toilet and urinal flush valves detect when the user is done, and automatically flushes for them. Select models allow a complimentary flush with the push of a button. Upgrade your commercial restroom with automatic flushers for toilets and urinals to provide the ultimate in hygiene and convenience. Cleanliness is the most paramount sector in every home and business entity. Touch Free concepts provide you the best quality solution concerning automatic urinal and toilet flushers. The automatic toilet flushers can detect once the users are done and flush it automatically. These flushers are vital and necessary if you desire the highest standards of hygiene in the toilets and urinals. With the use of these automatic flushers, you're assured of attractive, convenient and efficient health in the washrooms. It has helped many people and this has lead to its popularity and adoption. Rubbermaid automatic toilet flushers exist in different products depending on the features that each has and how each function. These products include; Rubbermaid AutoFlush clamp for toilets ( Sloan and Zurn flush valves) is one of the products which is a durable product and uses four c batteries. -having a sensor to distinguish between the real users and passers-by to avoid unnecessary flushes. -Its maintenance is relatively affordable due to its modern dry-scam that protects electro-circuiting which may arise due to water contact. -Installation of the product ensures that its fixtures are fastened because it has a courtesy flush which flushes automatically after use. -It has an indicator which shows the battery level to avoid malfunctioning. Another product is the Rubbermaid Autoflush sidemount for toilets (Delay flush valves) which also can last longer and works the same as the product explained above. -The product is natural to be installed since it does not require any water valve. 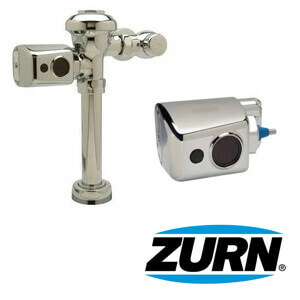 Zurn Aquasense flush automatic retrofit kit for closets and urinals is yet another product which can be easily connected, and it is adjustable and can fit any flush valve hence it is competent in the market. Replacement of its valve is the most straightforward process since it is flexible. It also has an automatic sensor which ensures that flushing is done by actual people only helps prevents water wastage. It is also durable and uses a four C battery as well as it produces LED light which indicates the battery level. Another product, Sloan ECOS 8111 dual flush battery, which has the highest sensor lock to regulate the amount of water and prevent any spread of diseases since it detects without touching it. Also, its maintenance cost is cheap and can last longer since it has a tube designed with a dual filter bypass. It is also designed in a way that it does not produce any noise when flushed. It also has low battery LED light to indicate the level of the cell. Furthermore, we have another user-friendly product which is also durable, and its maintenance cost is affordable due to its features. It has a seal that resists against every chemical hence improve its life. Its chrome plated valve ensures water conservation and prevents unnecessary flushes. The installation of automatic flushing solution is a key for bathroom hygiene because; it ensures that bathrooms remained clean and flushed at all time. They have a relatively cheap cost of acquiring and maintaining it. It has a long lifespan. More so it is reliable and efficient throughout. Further, it ensures maximum water conservation. In the recent past cleanliness especially in the washrooms has become of paramount concern to people as this has an impact on their lives. People have resorted to the use of automatic flushers as opposed to manual ones because of the merits it has as highlighted above.